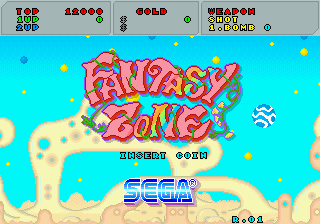 Fantasy Zone (ファンタジーゾーン) is a side-scrolling shoot-'em-up by Sega, originally released in 1986 for Sega System 16 arcade hardware. It is the first entry in the Fantasy Zone series, a franchise that would be supported by the company in the late 1980s but largely abandoned by the mid-1990s. Fantasy Zone stars the sentient being "Opa-Opa", a spaceship tasked with saving the "Fantasy Zone" from an army of invaders orchestrated by an unknown force. It is similar to Williams' 1980 arcade game Defender, in that the player can move both left and right across an endlessly repeating playfield, though makes a number of changes and additions to keep the game unique. Rather than simply destroying enemies, Opa-Opa has to eliminate eight "bases" across each level before being presented with an end boss, where horizontal scrolling is clamped. Opa-Opa has two firing modes - a pair of twin lasers which fire ahead, and a bomb which curves downwards to hit ground targets. Weapons and engines can be upgraded through the use of in-game shops, represented by balloons which appear at the start of the level. Yellow balloons also allow the player to switch weapons, assuming they have bought more than one. Unusually for shoot-'em-ups of the time, Fantasy Zone opted for vibrant pastel-coloured worlds and joyful music rather than the traditional "space" setting of previous attempts. It is often dubbed as the first "cute-'em-up" as a result. Despite this, Fantasy Zone is known for being an extremely difficult game, as the slow moving camera and swarms of enemies quickly lead to "bullet hell" scenarios. Simple enemies which move backwards and forwards across the screen, sometimes in pairs. They are spawned by the bases of Plaleaf. Bat-like creatures spawned by the bases of Tabas. They simply fly upwards. Spawned by the bases in Dolimicca, these enemies lock on to Opa-Opa's Y position and attempt to collide with him. This enemy is dropped by the bases of La Dune - it wanders along the floor, occasionally jumping to fire a shot. It is absent from the Master System version of the game, so its name is not yet known. Bases differ in design depending on the level, but all have the same function. They are the only static enemies in game, the only enemies to show up on the radar and are the primary target for Opa-Opa. Bases produce other enemies, typically weaker types such as Quili-Quili or Chamba. They will also fire at the player if Opa-Opa has had engine upgrades, making them a serious threat. Bases are the only enemies in game (aside from the bosses) which require more than one hit - the "damage" being shown on in the circle located in the centre - blue indicates full health, which changes to cyan, green, yellow, orange and finally red before being destroyed. A base does not disappear from the screen when destroyed like other enemies - the wreckage is left on the map and can be seen even during the boss fights. Long ago, far away in space there existed a "fantasy zone" where a couragous hero called Opa-Opa (the player) fought in a valiant cause to rescue the "fantasy zone" from its enemies. Plaleaf is the easiest stage of the game, and so shouldn't put up much of a challenge. Compared to later levels, the amount of enemies on screen is small (and most follow set patterns, so they can easily be avoided), so a decent player shouldn't need any upgrades to succeed. Enemies seen in this level include Moocolon, Quili-Quili, Sourtham, Bottaco and Thaya-Thaya. The boss, is also fairly simple. It tries to lock on to your Y position and fires a flurry of green bullets at you, though watch out as they sometimes rebound of the left hand side of the screen too. The weak point is the mouth. Tabas predictably ups the difficulty, though can just about be overcome without spending money on weapon upgrades. Enemies seen in this level include C-Soul, Botelynn, Asworm, Chamba and Coulon. The boss, regularly featured in cover artwork, does require some skill to overcome, however. It attacks Opa-Opa by erupting, causing fireballs to rain down on the player. Luckily, everything is a target, so the only concern is dodging the attack. By this point, the game will start to crush novice players, as the number of enemies vastly stats to increase. It marks the introduction of the "Goro" enemy - one that locks onto your screen position and will keep firing at you until you destroy it. This means, unlike previous stages, you can't run away from your problems in the hopes they'll disappear while off-screen. Enemies seen in this level include Goro, Pata, Onyamma, Bont and Poyon. La Dune's boss can also be tricky. The player needs to destroy each of the laser cannons located on the left hand side, though once most of them are out of the way, the boss will start to chase you. Predictably you have a much higher chance of survival if you've upgraded your engines at this point. Dolimicca is, surprisingly, an easier stage than La Dune, thanks to its decision to put all of its bases on the ground. This means if you arm yourself with the right weapon, you can scoot along the floor and wipe out several bases very quickly. That being said, the game still throws out a number of tricky enemies that you'll need to deal with, and by now, everything will start firing at you. Enemies seen in this level include Shatboo, F-Zab, Squel and Floweye. Dolimicca's boss is a typical "bullet hell" opponent. Opa-Opa has to destroy both arms, which swing about launching bullets all over the screen. Much like Tabas, the trick is to avoid enemy fire rather than concentrating shots, though the boss' body is invulnerable to attack. Polaria is a typical ice stage, and packs on even more pressure to assure the player runs out of lives. Enemies seen in this level include Jerry and M.F. Sourtham, Bont and Coulon also return. It's more masses of bullets when it comes to the boss, which consists of various different sizes of snowman. You have to destroy each column in order, starting with the smallest, though as you progress, the size of the bullets also increases. There's nothing particularly remarkable about any of the later stages in Fantasy Zone - they just throw out different assortments of enemies. By this point, the player will suffer if he or she has not upgraded their engine. On a side note, the music played on Mockstar's stage is used in Sonic & Sega All-Stars Racing, as Opa-Opa's "All-Star" theme. The only new enemy to be introduced is Billian. The rest, Jerry, Asworm, Botellyn, and Squel, come from earlier levels. Mockstar's boss is perhaps the cheapest in the game, as it comes into view from six different angles, increasing the chance of you being destroyed before you've even seen what's going on. The objective is to shoot the eye while it spins around at increasing speeds. Though it appears to be more inviting, Pocarius is the hardest level in the game. It becomes impossible for the average man to avoid the number of bullets, even if the arcade operator has put the game on "easy mode". Recal is introduced as an enemy here, though C-Soul, Pata, Poyon and M.F. also return. If by chance the player does succeed, he or she will be greeted by one of the hardest bosses. Though it doesn't attack, it will attempt to teleport on top of Opa-Opa, which means it's a case of "avoid, shoot, avoid, shoot". But once again, speed is proportional to damage, so in order to overcome this one you need fast reactions and the ability to fire rapidly. On a home system, it's the perfect example of how a turbo controller could come in handy. The final stage, Salfar as Opa-Opa duel with all the bosses he has encountered in the game so far, before the final showdown with the end boss. It's the only stage in the game that forces you to enter the shop - a smart idea as it's the last chance you'll get to use it. Dragon Land is a secret stage, exclusive to the Sharp X68000 version of the game. To access it, the bases in Plaleaf need to be attacked and destroyed in a certain order (from left to right, according to their positions on the radar). Doing so will drop the letters "H", "A", "R", "R", "I", "E", and "R", and when collected you'll be taken to this stage after Pocarius. Dragon Land is based on Space Harrier, and features enemies, music and a boss from that game (though everything is altered to work with Fantasy Zone's sideways perspective. Fantasy Zone was popular enough to see several ports to home consoles, though most remained exclusive to Japan. The watered down Sega Master System port is perhaps the most famous, as Fantasy Zone was one of the console's most highly rated games. Two of the more processor-intensive bosses were replaced in the SMS version - Dolimicca's boss, which now resembles a fish, and Mockstar's which resembles a turtle. The Master System version has since been released for the Wii's Virtual Console service. Sega would later release a near-perfect port of the game for Japanese Sega Saturns. The Saturn port has a karaoke mode, with vocals added to the tracks, and a replay mode. The game was ported to non-Sega consoles too. MSX, X68000 and TurboGrafx-16 ports were handled by Pony Canyon, Dempa and NEC Avenue respectively. The game was brought to Nintendo's Famicom by Sunsoft, but strangely Tengen also ported it to the NES for sale in North America. The Famicom and NES ports are both different, despite being made for what is essentially the same console. Previously, Tengen merely edited the Sunsoft versions and released the edited ROMs overseas; this may have had something to do with the decision to make Fantasy Zone from scratch. Nevertheless, both ports were done by Japanese companies (Tengen contracting to a group called Pixel, who outsourced (parts of?) the sound to Masaharu Iwata). There is also an unofficial Sharp MZ-700 port. Most home ports of Fantasy Zone greatly reduce the quality of the graphics, going so far as to remove backgrounds from boss fights altogether. The Master System version also removes the "radar", allowing the user to see where bases are placed on the map. Others, such as the NES port, reduce the number of bases in across the level, and drop the number of enemies in order to maintain a decent framerate. The Sharp X68000 port, however, is almost perfect, and is also notable for devoting a secret stage to Space Harrier (also set in the "fantasy zone"). Contrary to popular belief, the Game Gear game often known by the same name is a completely different game. The game was re-released twice as part of the PlayStation 2's Sega Ages 2500 series in Japan. Volume #3 of the series sees a remastered Fantasy Zone with 3D modes and four extra levels. This version was brought to the western world through Sega Classics Collection. It was later included in Volume #33 of the same series, along with the rest of the franchise, as part of Fantasy Zone Complete Collection. This version also includes an enhanced version of the Sunsoft Famicom port, named Fantasy Zone Neo Classic. In 2014, the arcade version was converted to 3D and released for the Nintendo 3DS as 3D Fantasy Zone: Opa-Opa Bros.. It was later included in the Sega 3D Fukkoku Archives compilation. The Master System version was also converted to 3D and included in Sega 3D Fukkoku Archives 2 as a hidden bonus game. This version also adds new audio for the FM Sound Unit, which the original did not support. Fantasy Zone was followed by Fantasy Zone II: The Tears of Opa-Opa, a similar game which was not released in arcades. Main article: Fantasy Zone/Magazine articles. NEC Retro has more information related to Fantasy Zone.